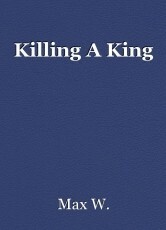 Killing A King , short story by Max W.
Short Story by: Max W.
The room was dim. The lamp was burning low on oil. The king himself gave me this room. My group was in the dining room, eating with the king, at the royal dinner. My bow and battle-axe were leaning against the wall, their shadows creating shapes. I was sharpening my arrow tips. There was a knock on the door. “Open Up!! The king expects your presence, now!” It was a guard. The door was open. The guard was wearing golden armor, but had only a sharp dagger. He’s not in the Underground Kingdom’s Army (Or UKA). My group seemed ready to leave but the king was nowhere in sight. I knew what was coming. I handed of the dragon eggs under my protection to the shaman in my group. I handed them my gear only keeping a hold on an arrow, one with the King’s name on it. The warm bed in my room was about to be a cold dead chamber. I would not live till the new choosing of a king. The king sat in his throne, the closest guard was outside the door (closed door). I raised my hand that holds the arrow with the king’s name on it, and threw it hard as possible. Luckily the king was blinking. I threw as fast as I could. The king opened his eyes, his cold dead eyes. The arrow had spit in two, like I had made it to. The first half hit the brain and penetrated the skull. The other half hit directly in to heart. Both hit at the same time, making a quick, quiet, painless death. I walked up to the dead king and took his sword. With one swing, I took his head off and threw it at the door. I screamed a war call in orcish. I wasn’t waiting for an executioner to kill me after rotting in a cell. I wasn’t going down without a fight. © Copyright 2019 Max W.. All rights reserved. Other Content by Max W.